There’s nothing quite like dinner and a show. And if you’re in the mood for a night on the town, allow us to make some delectable suggestions. Our restaurant partners offer something for every taste: Italian, Mexican, Seafood or American fare… fine dining, cozy pub or thriving local scene. And each of our restaurant partners is conveniently located in Downtown Lawrenceville, so you’ll never be far from the theatre when it’s time for the curtain to rise. City of Lawrenceville Parking Deck. Proudly serving Counter Culture Coffee in downtown Lawrenceville, GA.
We strive to deliver delicious BBQ and Cajun cuisine into one experience for our customers. In the end, the culture of each cuisine is the same...it is all about Family, Friends & Food. Local Republic was founded on the idea that, We, the people, want great food, wine and craft beer and don’t need the big guys to tell us what’s good—we know what’s good—and we celebrate it every time we sip a well crafted beer or eat a burger that hasn’t been processed to the point of landing somewhere else on the food pyramid. Our suppliers use natural and organic animal raising practices without antibiotics or added hormones. McCray’s Tavern on the Square is Lawrenceville’s premier bar & grill. Featuring the largest selection of beer on tap in the city we take pride in importing our craft beers. We also carry a large selection of wine, and we insist on using only the freshest ingredients in our food. An American classic sports bar and grill, we are the ultimate getaway for game day. Come join us for football season and enjoy our Game Day Menu with all the action on the big screen. Founded in October of 2009, Oyster Bay is a Florida-style seafood cafe located in the heart of Lawrenceville’s historic downtown district. Steve Green, owner, spent over two decades in the St. Pete area of Florida in restaurants and brings that experience and knowledge to Oyster Bay with unique and enjoyable dishes, from smoked fish dip to stuffed grouper and conch fritters (as well as oysters!). T-Ray's Fire Grill guarantees the highest quality certified Angus Beef, to ensure that you have the best flavor and the best experience. Steak isn't the only thing they cook to perfection. T-Ray's offers a variety of delicious dishes that everyone in your party will love. From fire grilled poblano chicken and escargot to scallop risotto and grilled portobello, their flavors are what make them one of a kind. Universal Joint Lawrenceville offers great food, an always-rotating draft & bottle selection, a friendly neighborhood atmosphere, and an easy going bar scene. Come enjoy their patios, yell at their TV’s when your team is playing, grab a bite to eat with a refreshingly cold beer, and meet new friends. They are open and can’t wait to meet you! Hampton Inn Lawrenceville is our preferred hotel partner. 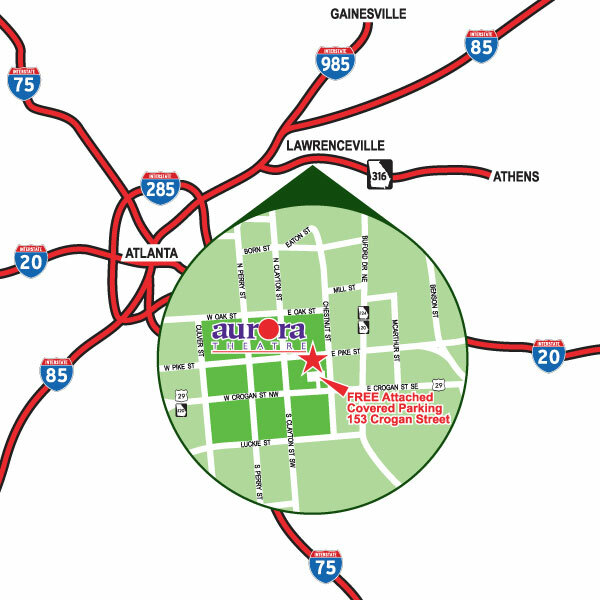 Conveniently located just off Highway 316 and only 3.5 miles from Downtown Lawrenceville and Aurora Theatre.